Growing up I loved creamed corn from a can! 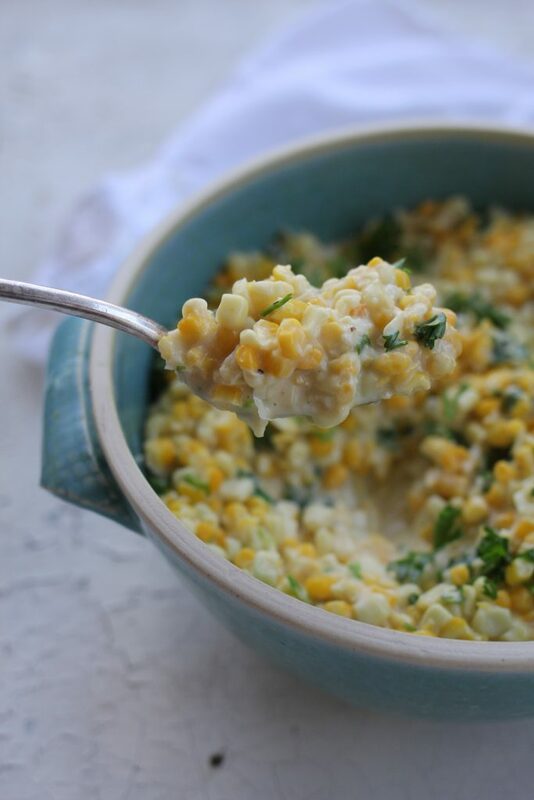 This recipe for Creamed Corn with Cheese and Parsley is a fresh, updated version of the classic dish everyone loves. It’s creamy, cheesy, and brings a little color to the table. 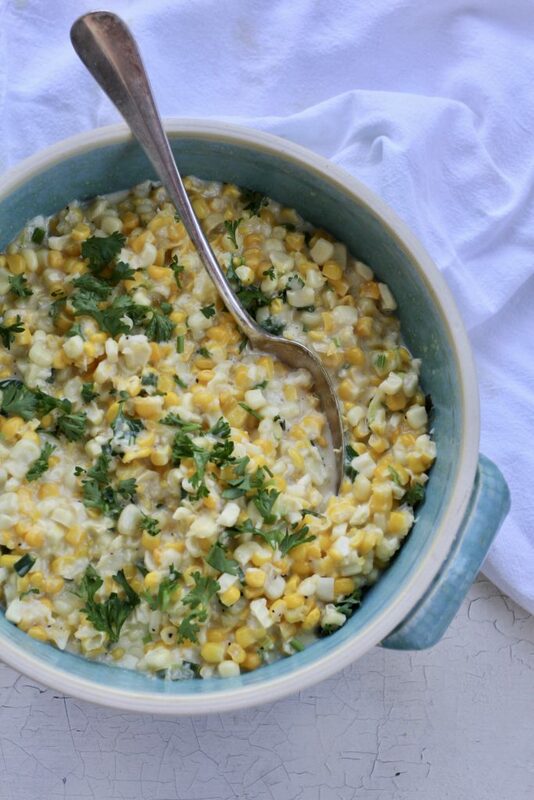 Who doesn’t love a dish with buttery sweet corn? The instructions for make ahead are in the recipe notes. We usually have leftovers from this dish, which I absolutely love. It heats up perfectly and is AMAZING in a quesadilla. I just chop a bit of chicken, add to my tortilla and cheese and then add some of this Creamed Corn with Cheese and Parsley to the quesadilla (heated up for a minute) and dinner is served. I love using frozen corn for this recipe. It’s easy, simple and it tastes better than canned corn. Plus it’s not as sweet as canned corn so it combines well with the other ingredients. You can substitute out the parsley if you like and add cilantro or chopped fresh basil leaves, depending on what type of a meal you are serving. I really love parsley in this dish. 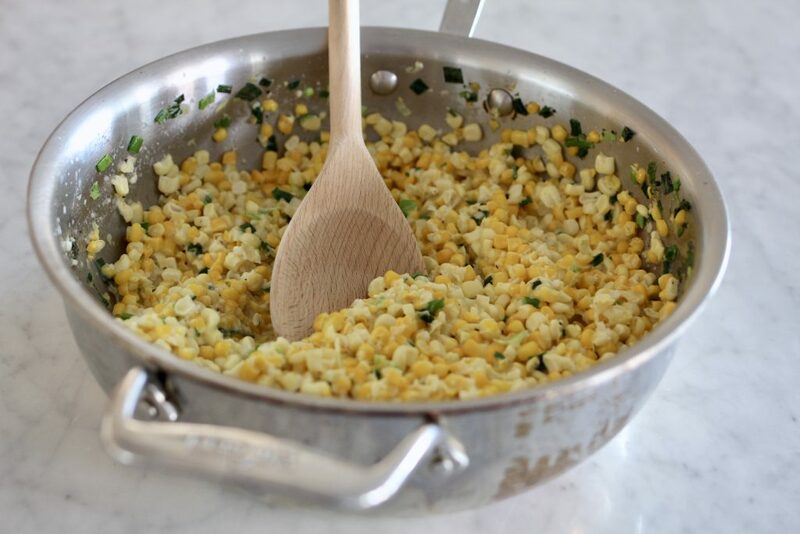 The bright green against the yellow corn makes a beautiful side dish for any meal. This is a Thanksgiving dish that adds a rich and slightly creamy texture to your holiday table. With a large holiday meal, this recipe easily serves 10-12 as a side dish. Put this on your list of sides for turkey day. I promise, it will be a huge hit! 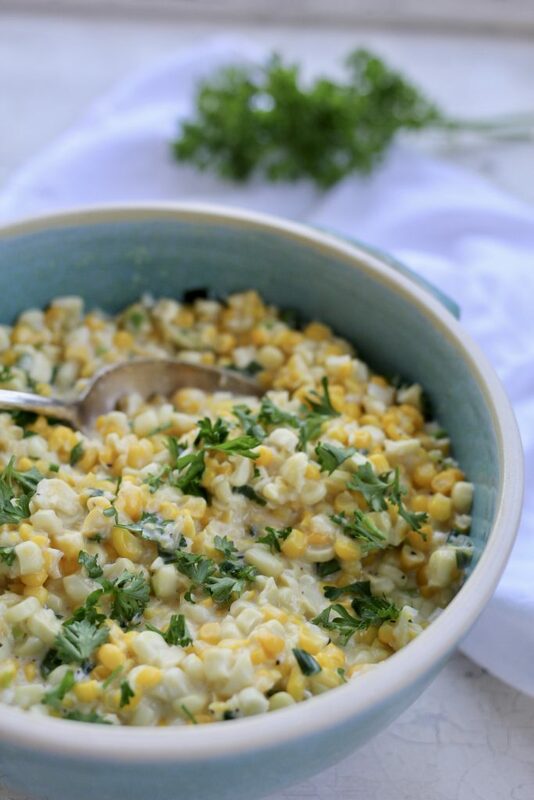 This creamy, cheesey, buttery dish made with corn and parsley is one of our favorite side dishes! It comes together in a flash and seems much more special than a bowl of heated up corn. Perfect for any type of dinner and the leftovers are to die for in a quesadilla! Heat butter in a large pan over medium heat until melted, then add chopped scallions, stirring occasionally, until softened, about 2 minutes. Add corn, salt and pepper. Cook, stirring occasionally for about 2-3 minutes. Whisk together cream and cornstarch in a small bowl until thoroughly combined, then add to corn and simmer, stirring, until slightly thickened, about 3 minutes. Transfer 1 cup of corn mixture to a blender with garlic and blend on low (use caution when blending hot liquids). OR if you have an immersion blender, place the immersion blender in the pan and pulse in several places, blending about a third of the corn mixture. After blending, return corn to skillet, add grated cheddar and 1/2 cup of the Parmesan cheese and cook, stirring, until just heated through. Transfer corn to a large shallow serving bowl. Sprinkle remaining 1/2 cup of Parmesan cheese and a bit of parsley over top. I used 1 cup of grated white cheddar and 1/2 cup grated Parmesan folded into the corn before spooning into the serving dish. Scallions and green onions are the same (some are harvested earlier). In this recipe use the green and the white part of the scallion or green onion. If you are making this ahead of time, make this recipe to the point of adding the cornstarch and cream, cook and the blend the corn. At this time you may refrigerate in a bowl until day of serving. When ready to serve, place back in a skillet or pan, add the cheeses and heat up the dish for the last time on stovetop just before serving. If using fresh corn on the cob, you will need about 12 ears of corn. Cut the corn from the cob, and cook in the butter in the first step for about 5 minutes stirring frequently. Then proceed with recipe directions. Hello! I just wanted to make sure you got my address? Let me know! Thank you so much! Thanks for another wonderful recipe and hope that you're having a wonderful Christmas. Does the frozen corn need to be defrosted first before cooking?